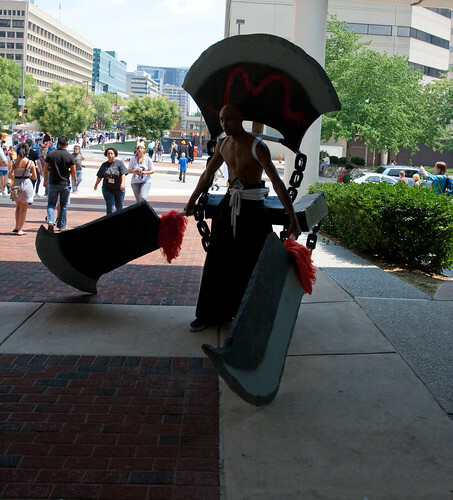 These Soul Eater cosplayers have appeared before on this list and will appear at least once more. I think this photo is unique in showing them from head (or hat) to toe. For the first time, I’ve realized that the woman on the right has “elf shoes” or shoes with curly toes. I think it’s pretty odd how much of a gap there is in the number of views between all these photos of the same subjects. 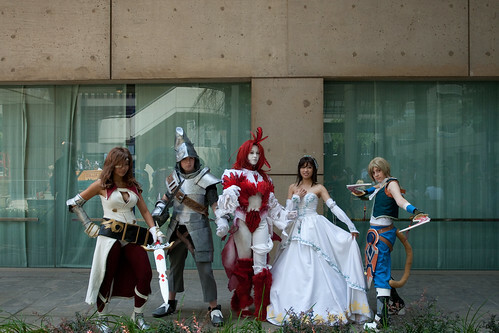 Cosplay, a Japanese portmanteau short for costume play, is a pretty interesting hobby. If you don’t count the types of Halloween costumes on display at the Greenwich Village Halloween Parade, Halloween costumes tend to revolve around mass manufactured costumes you get at Party City or Wal-Mart. But cosplay (as far as I know) tends to be 99% home-made costumes. So a cosplayer needs to either be good at creating costumes, or know someone who is. Then, unless their costume is something like Iron Man, they need to be the type of person who’s comfortable being the center of attention. While most artists tend to make work separate from themselves, a costume that someone wears depends on that person as well. This is exacerbated by mean-spirited sites that showcase people who are “too fat to cosplay”. Additionally, some costumes tend to be a group affair. So you need to have a group of like-minded and dependable friends so you can have the entire ensemble. And there’s always a trade-off between an impressive costume and one that won’t be a pain to wear all day long. Of course, there’s also the decision of what game, movie, or TV show you’re going to choose for you inspiration. I think that the two biggest reasons why I haven’t done a cosplay involve the work required to get the costume not to be embarrassingly horrible and the fact that I can’t decide what I’d actually like to be.